From opinion polls and clinical trials to self-driving cars, statistics influences and shapes the world around us. Best-selling author Marty Triola is committed to keeping Elementary Statistics Using the TI-83/84 Plus Calculator current — with an unprecedented amount of current real data — so that students of all majors understand the role of statistics in the world around them. In addition to an abundance of new data sets, examples, and exercises, the 5th Edition is even more effective for today’s instructors with the addition of learning objectives as an organizational tool, larger data sets, and new topics and organization in line with advancements in statistics education. In addition, students will find more support in an all-new series of videos, additional opportunities for practice, and improved support for statistical software. Elementary Statistics Using the TI-83/84 Plus Calculator is part of a series that includes Elementary Statistics, Essentials of Statistics, and Elementary Statistics Using Excel. Data sets and other resources for this series are available at our website. MyLab™ Statistics is the teaching and learning platform that empowers instructors to reach every student. By combining trusted author content with digital tools and a flexible platform, MyLab personalizes the learning experience and improves results for each student. With MyLab Statistics and StatCrunch, an integrated web-based statistical software program, students learn the skills they need to interact with data in the real world. Note: You are purchasing a standalone product; MyLab Statistics does not come packaged with this content. Students, if interested in purchasing this title with MyLab Statistics, ask your instructor to confirm the correct package ISBN and Course ID. Instructors, contact your Pearson representative for more information. Mario F. Triola is a Professor Emeritus of Mathematics at Dutchess Community College, where he has taught statistics for over 30 years. Marty is the author of Elementary Statistics, 13th Edition, Elementary Statistics Using Excel, 6th Edition and Elementary Statistics Using the TI-83/84 Plus Calculator, 5th Edition; he is a co-author of Biostatistics for the Biological and Health Sciences, 2nd Edition, Statistical Reasoning for Everyday Life, 5th Edition, and Business Statistics . 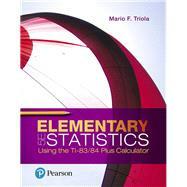 Elementary Statistics is currently available as an International Edition, and it has been translated into several foreign languages. Marty designed the original Statdisk statistical software, and he has written several manuals and workbooks for technology supporting statistics education. He has been a speaker at many conferences and colleges. Marty’s consulting work includes the design of casino slot machines and fishing rods. He has worked with attorneys in determining probabilities in paternity lawsuits, analyzing data in medical malpractice lawsuits, identifying salary inequities based on gender, and analyzing disputed election results. He has also used statistical methods in analyzing medical school surveys, and in analyzing survey results for the New York City Transit Authority. Marty has testified as an expert witness in the New York State Supreme Court. The Text and Academic Authors Association has awarded Marty a “Texty” for Excellence for his work on Elementary Statistics.